What is a Makerspace, I’ve never heard of this? A Makerspace is a collaborative workspace for hands on making and learning where students can gather to create, invent, explore and discover by using a variety of tools and materials. A space where teachers actively help students develop critical thinking, self-confidence and STEM skills. What school is going get a Makerspace and where is it going to go? The goal is for every school to be able to have a Makerspace inside their building. The space can be big or small. The Principal and Staff at each school will determine what their needs are to create the space that works best for their school community. Each school is different and has different needs and wants. We will raise the money and let the schools decide how they can provide a Makerspace that best works for their students and staff. Why are we raising money for a Makerspace when there are so many other needs for our district? The WGSD Foundation mission is to be able to provide innovative ideas in our student’s classrooms. Through a series of questions that were asked to teachers across our district, the feedback of what their “dream” idea would be resulted in numerous requests for a Makerspace. We are excited to be able to fund their dream! How much does a Makerspace cost? The cost of a Makerspace can vary significantly. A Makerspace can be big or small. That’s the exciting part about this program. There are no limits as to how creative the space can be. A Makerspace can be started from a few hundred dollars or can cost thousands of dollars to kick-start. The more money our community raises, the more opportunity each school will have to create a space that is unique for their students and teachers. I am an Alumni, can I still make a Teacher Tribute? Absolutely YES! We encourage all of our community including current students, parents, staff and even alumni to make a donation and include Teacher Tribute. Even if your favorite teacher(s) may not be teaching in the district we want to recognize who they are and why they were inspirational to you. A note of “thanks” will be shared with every teacher that is recognized. Check the Foundation website at http://www.wgsdfoundation.org/teacher-tribute-recognition.html to see the list of teachers who have made a difference in the lives of students across the district. We already have a Makerspace at our school in my kid’s Science/Art/room. Why raise money for this? Yes, that is great and some of the funding from that came from Grants for the WGSD Foundation. These spaces are so exciting we want every student to have access to these spaces. What happens if my school already has a Makerspace started? What an exciting opportunity that will be for your school! 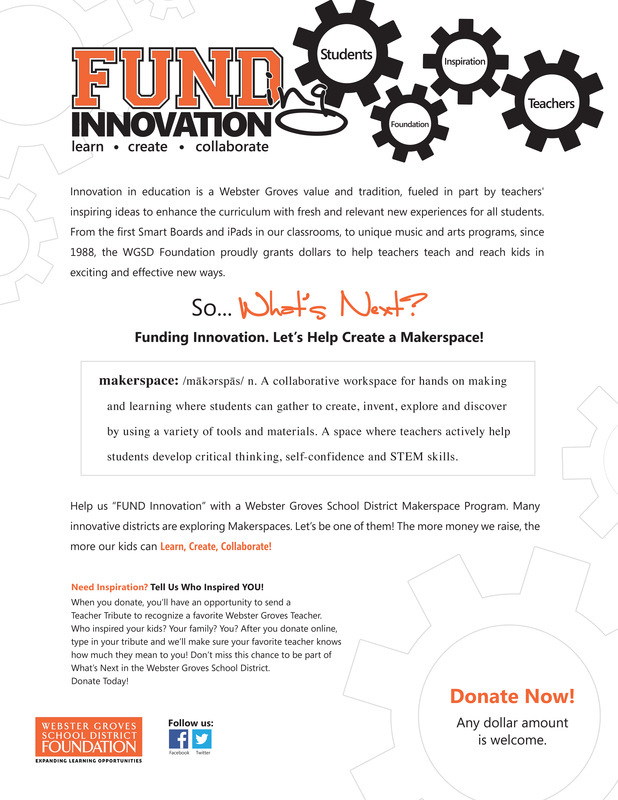 The money raised will allow any existing Makerspace to grow to accommodate more students in your school. Each school has such different needs and spaces. The Principal and Staff at each school will work to create spaces unique to their needs.